You guys know that I love to organize things. It makes me happy, plus it helps in my small spaces. Last week I hit up The Dollar Tree and got some great items to organize my nerdy stuff and it really made my shelves about a thousand times better. That left me needing and wanting to better organize my jewelry and makeup. There’s nothing worse than trying to find some jewelry and not finding it. I really didn’t have good storage for my jewelry and I decided that I needed to rectify this. The Dollar Tree is fantastic, but they don’t really have anything good in this regard. Next thing I knew, I found these fantastic acrylic 4-drawer units by Sodynee on Amazon for a fairly decent price. 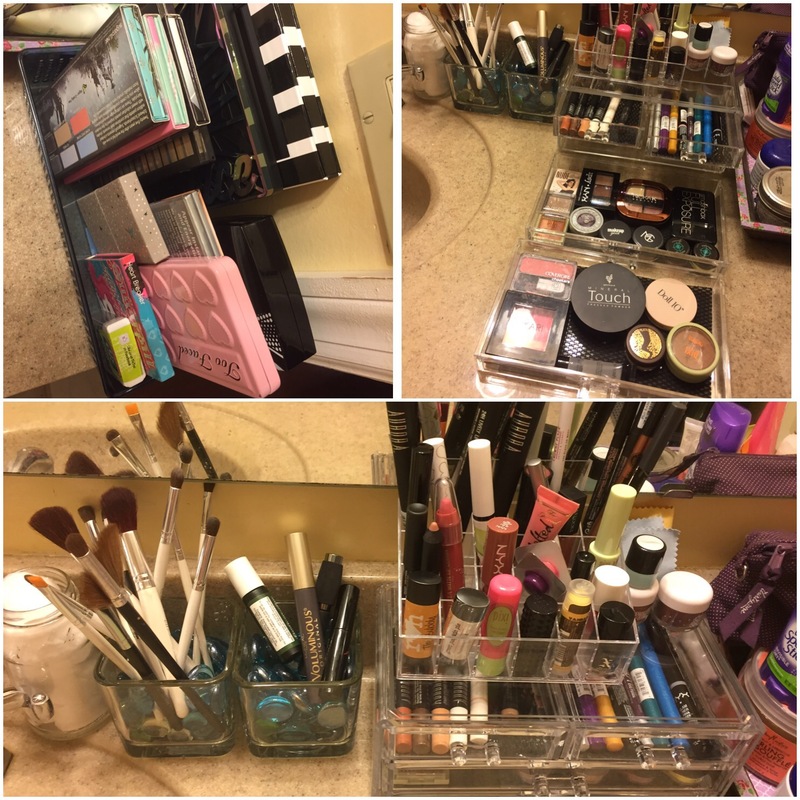 I picked up an extra one for my makeup and a matching 3-drawer to also use for jewelry.. Once they came in, it took a little bit of work to decide how best to use them and where to store them. I ended up deciding they looked good on the hutch on my dresser, which is where I keep my earring trees. I’m excited at how nice these look! I moved from there to my makeup. Again, it took a little bit of trial and error, but I finally decide on a system. I love using a drawer for each item. I don’t have a lot of makeup, but I have more than some people. One drawer holds blush and face, another holds eye shadows. The two little drawers hold pencils/crayons. 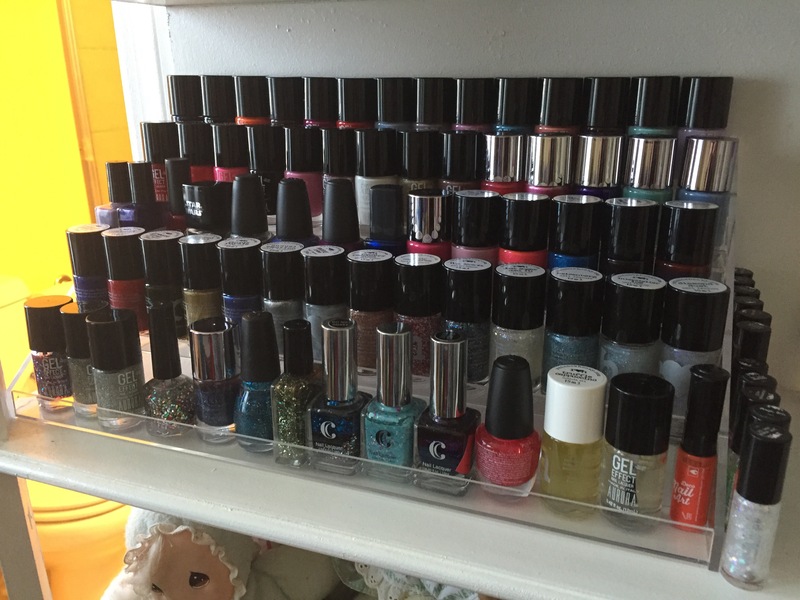 I picked up a great nail polish rack by Home-It, which was just about perfect for my nail polish collection. Now i can more easily see my polish to select a manicure theme! Before my polish sat in a drawer in my bathroom vanity, in three trays from The Dollar Tree stacked on top of each other. Talk about not helpful! Freeing up those bins from polish meant I could use one for my palettes! Excellent! I’m so excited for this so I can have everything at my disposal when I sit down to do makeup. I keep rearranging it, looking for the best way to display my palettes. I don’t do my makeup every day, because I’m happy with how I look without it. I do enjoy it for fun, going out, and of course I need it when I act. Sometimes, I just enjoy coming up with a look just for fun. It’s been a long time since I really did decorative/fancy/stage makeup, but I think it’s always all about the fun as much as anything else. As an actress and dancer, makeup is about the persona you are portraying, a mask. Well, masks can be simple, fancy, or fun! I also used votive cups I got from The Dollar Tree and filled with colored stones for holding brushes and my mascara. I love finding ways to organize on a budget. 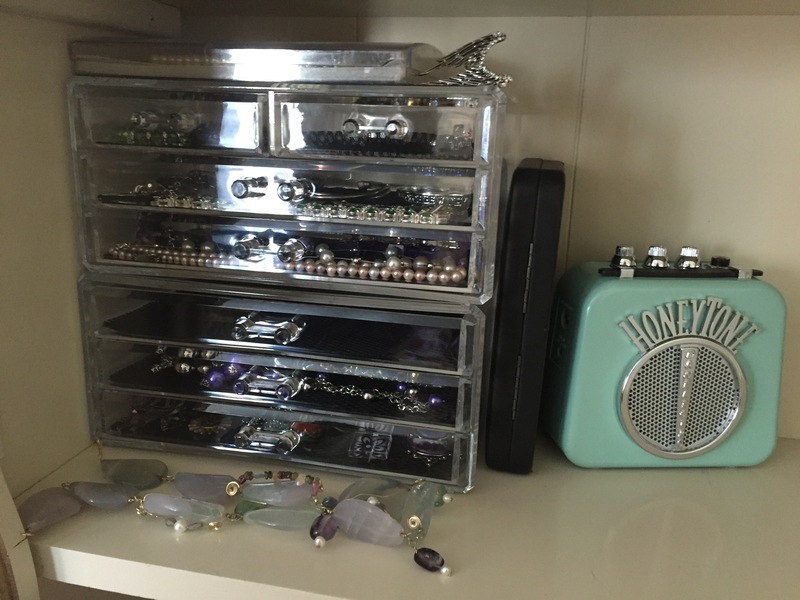 What are your favorite ways to organize your jewelry and makeup? Share in the comments! Also, if you’d like to see me make a youtube video giving a tour of things, let me know! Products were purchased by me for me and on my own. Reviews and ideas for your benefit because I like to share. Links go solely to Amazon with no kickback to me. However, I do recommend utilizing Amazon Smile if you make a purchase and donate to charity. If you’re looking for a good one, I also recommend St. Jude’s for pediatric cancer. Wow, everything is so neat! I love how it looks! Thank you! I’m really excited with how it turned out!